A section in Umbraco is where you do specific tasks related to that section. For example Content, Settings and Users are all sections. You can navigate between the different sections by clicking the corresponding icon in the section menu which is in the top of the Backoffice. The Section menu is the horizontal menu located in the top of the Backoffice. In order to create content you must define it using Document Types. The Media section contains the media for the website. By default you can create folders and upload media files (images and PDFs). You can customize the existing media types or define your own from the Settings section. The Settings section is where you can work with the website layout files, languages, and define media and content types. In this section you can also find the Log Viewer to browse through your log files. 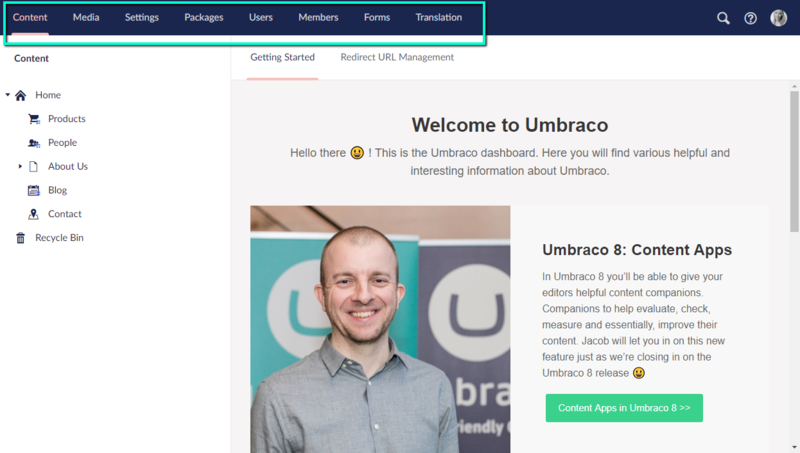 In this section you can browse and install packages into your Umbraco solution. You can also get an overview of all installed packages as well as uninstall packages you no longer need. Manage, create and customize Backoffice users and user groups. Manage, create and customize members and member groups. You can install Umbraco Forms directly from the Backoffice by clicking the install button. Once installed this section is where you create and manage your forms. This is the section where you create and manage your dictionary items. In the top-right corner you'll find a search tool, which is also accessible by hitting CTRL + Space on your keyboard. Next to the search tool, there's a help sections, where you can find Backoffice tours as well as links to Umbraco resources such as documentation and UmbracoTV. There's also a small user section with shortcuts to edit the user that's currently logged in, and view most recent activities.